AFB Presents Starman's Toys I Grew Up With: The Resurrection of Monstress! It’s a new month, and that means another edition of Toys I Grew Up With from our friend Starman! This is actually the latest TIGW feature that Stars has posted at the AFB Forum, but I was so taken with it I decided to fast-track it to the blog. One of the things I really love about Starman’s board at the forum is the way that he unearths stuff I’ve never heard of – and today’s items are certainly in that category! 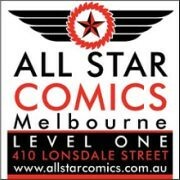 Without further ado – over to Stars! Ok, today we have a real treat - OR TRICK!! Resurrection of Monstress was a Japanese toyline released in the late 1990's by Yellow Submarine that gave us modernized female versions of the "classic" horror monsters. There were originally three planned series, of which only two were released. All of the accessories are detachable and can store with the bases to some degree, which varies from figure to figure. Each lady came with one variant, and one figure had 3 different versions. So, onto the toys. Shall we? Curia had 3 different figures. There is the standard black, the clear versionand a red version which I do not have and couldn't find pics for. The large coffin can store Curia, her sword, her three bats, two syringes, a blood transfusion pack and bat monster. 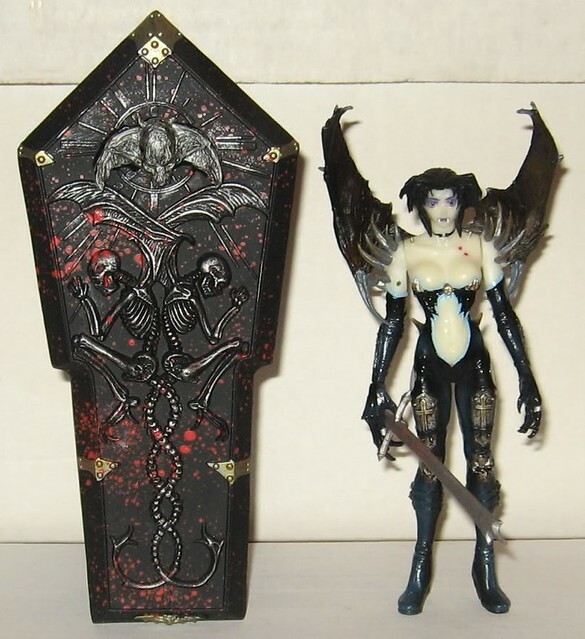 The winged skull on the coffin is also detachable. Wolfinica came in the standard brown version and the purple version, which I have. All of her gear can store within the back of the large amp via pegs. Notice the yellow "wolvie" claw, the detachable wolf paw, the dog and two rats. The ONLY thing that is non-removable is the towel. She also comes with a little dog skull with a nail sticking out of it. Steela’s two versions are the standard grey/blue and the variant neon yellow/green. She comes with a lightning bolt necklace, a steampunk glove for her right hand, a frankenstein mouse, a skull, a brain, two vials, a syringe, a scalpel, and a pair of pliers. She also has a base which rotates from upright to horizontal with sides that rotate independently. Also, the electricity bolts can attach to her neck or shoulders and they are completely removable from the lab table. Gillealla had a standard version and a clear version. Her "treasures" include a nice dagger with a seahorse motif, a re-breather pack with a mask that looks like her daddy, her dad's skull, two fish skeletons, and a treasure chest filled with coins and an octopus!!! Phanteana’s two versions are the neon/silver that I have and the gold/black combo shown on the cardback. 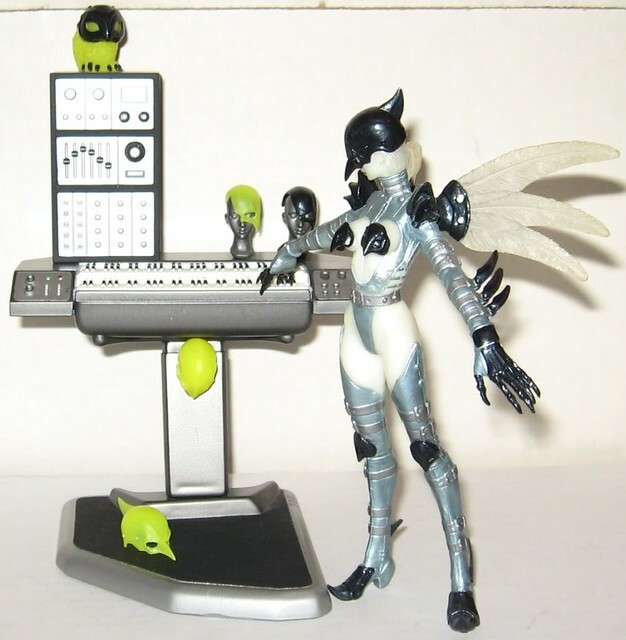 She comes with two full masks, two half masks, an owl, a mask wearing skull, two mannequin head for the masks, a mixing board and a keyboard. 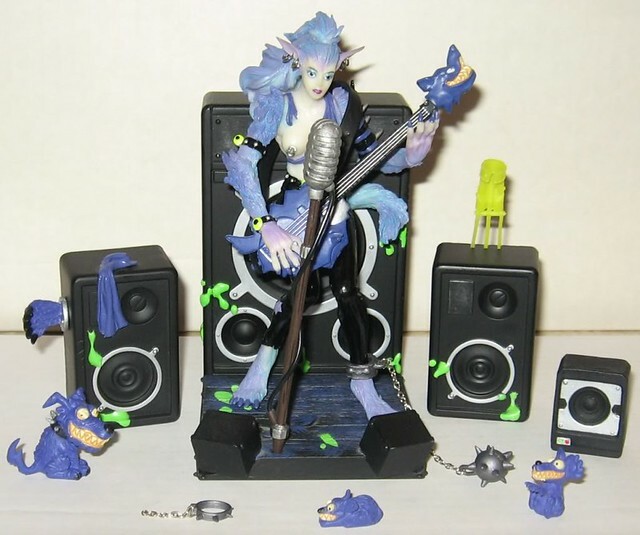 Noctilca is EASILY one of the best of these figures just based on the cool stuff she comes with and her look. Her two versions are the pink one that I have and the orange version shown on the cardback. She comes with a pumpkin with an opening jaw, a cat, a cauldron, a spoon, two mushrooms, a clove of garlic, an eyeball, and two pieces of mandrake, a hat, a newt and her broom. As always, Stars has put together a wide range of pics of these figures that really need to be seen to appreciate them. Have a look at them here at the AFB Forum and then add your discussion to the thread! Of course, you can comment on this post to enter the April AFB Comment of the Month Contest! I actually had the Vampire one years ago that i picked up at a local comic book shop before it went "belly up". Nice figure which i passed along to a friend that was really into vampires. I'm missing the Blue/Gray version of Franken Steela and the dog skull with the nail in it for the Brown version of Wolfinica. If anyone can help me with these it would be greatly appreciated. It would be nice to get me set completed. I have the pink version of Noctilca too. :) I always wondered what the others in the series looked like.